40 • August 2018 • S I G N & D I G I T A L G R A P H I C S DIGITAL PRINTING AND FINISHING DIGITAL GRAPHICS Brush Up on Brushes Brush techniques spice up your artwork Stephen Romaniello is an artist and edu- cator who has been teaches digital art at Pima Community College in Tucson, Arizona for more than twenty-six years. He is a certi- fied instructor in Adobe Photoshop and the author of numerous books and articles on the creative use of digital graphics software. Steve is the founder of GlobalEye Systems, a company that offers training and consulting in digital graphics software and creative imaging. B Y S T E P H E N R O M A N I E L L O The Digital Eye whose characteristics such as size, hardness, spacing, roundness, and angle can be controlled. 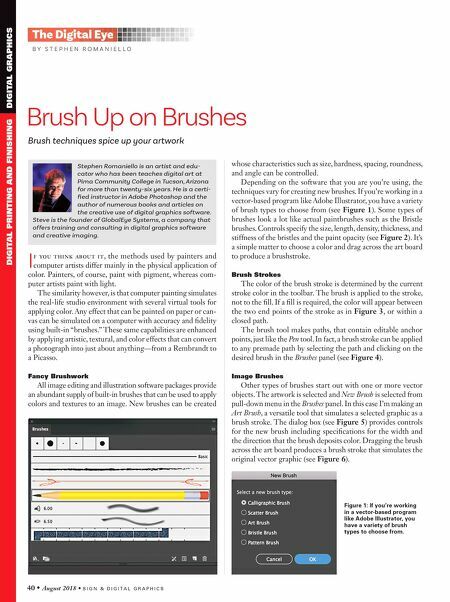 Depending on the software that you are you're using, the techniques vary for creating new brushes. If you're working in a vector-based program like Adobe Illustrator, you have a variety of brush types to choose from (see Figure 1). Some types of brushes look a lot like actual paintbrushes such as the Bristle brushes. Controls specify the size, length, density, thickness, and stiffness of the bristles and the paint opacity (see Figure 2). It's a simple matter to choose a color and drag across the art board to produce a brushstroke. Brush Strokes The color of the brush stroke is determined by the current stroke color in the toolbar. The brush is applied to the stroke, not to the fill. If a fill is required, the color will appear between the two end points of the stroke as in Figure 3, or within a closed path. The brush tool makes paths, that contain editable anchor points, just like the Pen tool. In fact, a brush stroke can be applied to any premade path by selecting the path and clicking on the desired brush in the Brushes panel (see Figure 4). Image Brushes Other types of brushes start out with one or more vector objects. The artwork is selected and New Brush is selected from pull-down menu in the Brushes panel. In this case I'm making an Art Brush, a versatile tool that simulates a selected graphic as a brush stroke. 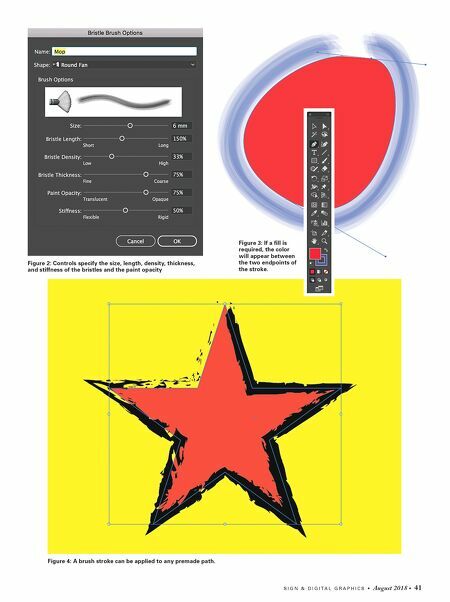 The dialog box (see Figure 5) provides controls for the new brush including specifications for the width and the direction that the brush deposits color. Dragging the brush across the art board produces a brush stroke that simulates the original vector graphic (see Figure 6). I f you think about it, the methods used by painters and computer artists differ mainly in the physical application of color. Painters, of course, paint with pigment, whereas com- puter artists paint with light. The similarity however, is that computer painting simulates the real-life studio environment with several virtual tools for applying color. Any effect that can be painted on paper or can- vas can be simulated on a computer with accuracy and fidelity using built-in "brushes." These same capabilities are enhanced by applying artistic, textural, and color effects that can convert a photograph into just about anything—from a Rembrandt to a Picasso. Fancy Brushwork All image editing and illustration software packages provide an abundant supply of built-in brushes that can be used to apply colors and textures to an image. New brushes can be created Figure 1: If you're working in a vector-based program like Adobe Illustrator, you have a variety of brush types to choose from.